Born in the isolated town of Tobolsk, in Siberia, Russia, in 1834, Mendeleyev was the last of 14 children. His widowed mother, who operated a glass works factory, sought a better education for him than was available in Siberia and took him to St. Petersburg. There he studied chemistry, physics, and mathematics. Mendeleyev traveled to Europe to study with great chemists in France and Germany. Eventually, he returned to Russia. During his studies Mendeleyev investigated the characteristics of the 63 known elements. Mendeleyev wrote an organic chemistry text, Principles of Chemistry, that was published from 1868 to 1870. This earned him a full professorship at the University of St. Petersburg, where he had earned a doctorate with a dissertation on “The Union of Alcohol with Water.” While working on the text, he began to search for a way to systematically describe the elements. Certain groups acted in similar ways. Mendeleyev created cards for each element that included its physical properties and all known characteristics of how it behaved chemically. He knew the atomic weights of each element and so used that to begin arranging them. In addition to the linear progression Mendeleyev put certain elements in groups by shared characteristics. By 1869 he published a table that organized the elements horizontally by weight and vertically by families of properties; he produced a revised table that was published in 1871. He had noticed that these traits repeated every seventh element, which led him to describe the table as “periodic.” Mendeleyev soon revised his original table to incorporate blank spaces. These voids, he predicted, were the locations of undiscovered elements. This was a revolutionary idea. He described the relative weights and properties of the unknown substances. Within 15 years, three of the missing elements had been discovered. Mendeleyev worked to apply science to problems of his country and was lauded in Russia for his work with petroleum and his suggestions on how to improve the efficiency of the petroleum industry. His other civic work included written recommendations on standardization of weights and measures; shipbuilding and trade routes; and manufacture of smokeless powder. Mendeleyev was also a champion of human rights; he advocated progressive reform of Russia’s tsarist regime, an opinion that caused him to lose his academic post at the University of St. Petersburg. He continued to be involved with chemistry and how it could help society for the remainder of his life. He was nominated for a Nobel Prize in 1906 but lost by one vote. 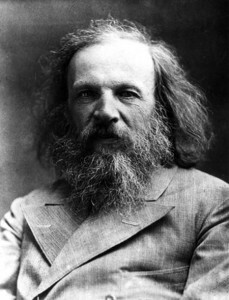 Mendeleyev died on February 2, 1907. Mendeleyev’s legacy rests on his insightful organization of the elements in the Periodic Table. This system of organizing the elements, based upon atomic weight and shared characteristics, helped future scientists understand the nature of matter and paved the way for future discoveries of unknown elements. Mendeleyev spurred other researchers across Europe to seek out the missing elements. The table gave them clues and inspiration. The first discovery of a new element, gallinium, came in 1875. Soon after, in 1879, Lars Fredrick Nilson discovered scandium in its oxide form, scandia, and German chemist Glemens Winkler discovered germanium in 1886. Mendeleyev had predicted the existence of all three of these new elements. Mendeleyev’s recognition of the patterns of properties among the elements helped others to better understand matter. He was also willing to question commonly accepted knowledge. When several elements fit the pattern by characteristic but not weight, Mendeleyev suggested that the weights were incorrect. He was eventually proven correct. As scientists accepted Mendeleyev’s Periodic Table, they sought to add to it. Researchers also strove to understand why certain groups of elements acted in similar ways. Changes were made in Mendeleyev’s original scheme when six new gases were discovered late in the nineteenth century. These chemically inactive elements, the inert or noble gases (helium, neon, argon, krypton, xenon, and radon), were assigned to a column of their own, expanding the original table. In 1912 Henry Moseley discovered that the atomic number or number of protons was the key to the order of elements. In 1955 element 101 was named mendelevium in Mendeleyev’s honor. Mendeleyev’s work and reports on practical matters fading Russian society, including the petroleum industry and the standardization of weights and measures, contributed to the modernization of Russia.